Foreign trade is vitally important to the United States economy and the international movement of goods and materials has highlighted the significance of harbor access and development issues. Natural harbors, typically in bays, estuaries , and river mouths, occur where land and water converges in such a way as to protect ships from wind and waves as they enter and dock. Harbors can also be constructed using jetties and breakwaters to provide protection for ships. Harbors include entrance channels, interior channels (to allow movement to anchoring areas or turning basins), and support facilities for refueling and repairing vessels. Harbors can be located either on the coast (such as the harbor at Long Beach, California, located on the coast of the Pacific Ocean) or on inland waterbodies (such as the harbor at Chicago, Illinois, located on Lake Michigan). About 95 percent of all U.S. trade passes through its nationwide system of ports. 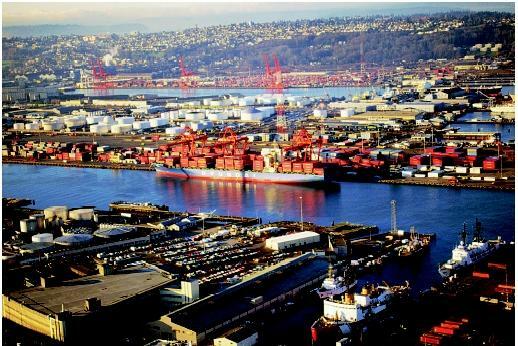 Terminal facilities like those visible here in the Port of Seattle handle container cargo moving between water-based and land-based transport systems. Ports are transfer hubs for trade and are usually built near natural harbors, but they can also be located hundreds of miles up rivers or lakes. For example, in Texas, the Port of Corpus Christi is located along the coast of the Gulf of Mexico. About 320 kilometers (200 miles) north is the Port of Houston, a 40-kilometer (25-mile) long complex of public and private facilities located inland along the Houston Ship Channel. Harbors vary in location, construction, and purpose. The inner harbor area at Erie, Pennsylvania exemplifies a lake harbor (Lake Erie, top). 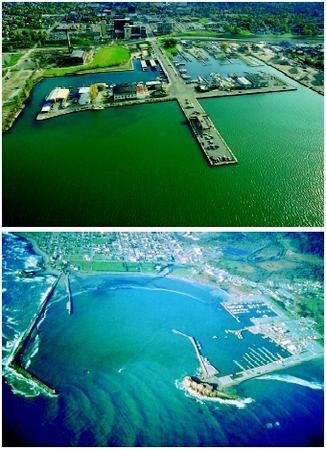 California's Crescent City harbor is a coastal harbor with breakwaters (Pacific Ocean, bottom). etc. ), liquid (e.g., petroleum), dry bulk (e.g., grain), and general cargo in steel containers. There are over 260 coastal and inland ports throughout the United States. The states of Texas and Louisiana have the most commercial port facilities. Some of the largest U.S. ports are located on inland waterways, including Houston (Texas), Mobile (Alabama), New Orleans (Louisiana), and Portland (Oregon). The port city farthest from the ocean, Fairmont, West Virginia, is 3,355 kilometers (2,085 miles) via an inland waterway. Increasing public demand for recreational uses of harbors sometimes competes with plans for port development. 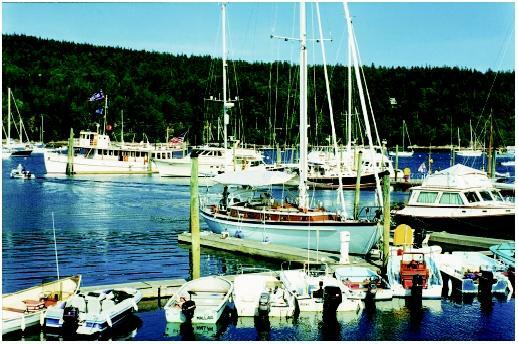 This harbor in Maine is typical of U.S. coastal harbors used predominantly by recreational boaters and fishers. government is charged with building and maintaining waterways when it is of substantial benefit to the country. The U.S. Army Corps of Engineers works with local areas to design, build, and maintain waterways; this can include dredging channels, building locks, and so on. However, it is the local port authority that is responsible for the economic planning to make the port a viable operation; this can include attracting clients, planning buildings and equipment, coordinating the distribution of imports and exports, and so on. Well-maintained channels are vital to the success of any port. Typically the Army Corps of Engineers and various local sponsors work together as partners in the planning process and the costs of waterway projects are shared. Navigation planning must consider many factors, including channel width and depth, shipping and navigation technologies, terminal facilities, climate, seasonal variations, currents, tides, and physical limitations of a waterway (such as bottom conditions). Planners seek to determine the best locations for channels, harbors, and canals. Recent developments in hydraulic modeling have greatly aided these planning efforts. The overall goal of these planning projects is to maximize the benefits of the port to a community. Historically, ports were constructed in geographically favorable locations to expedite the transfer of goods. Active dockside communities emerged and thrived as waterborne trade flourished. The use of available land for landside facilities development was acceptable, meeting few obstacles because such expansion was in the name of economic prosperity. However, as the twentieth century closed and the twenty-first century emerged, many port locations desired landside facility expansions but faced several obstacles, including land use. Changes in the shipping industry have changed the face of ports. For example, landside facilities capable of accommodating large containerships require long berth lengths, large cranes, and railway or highway access. In most cases, accommodating these increased demands for landside facilities requires the acquisition and development of adjacent land. Yet many port communities have encountered competing demands for waterside land for purposes other than those related to waterborne commerce: namely, commercial, residential, and recreational uses. The result has been disagreement over the use and development of available land. The increased awareness of environmental conditions has significantly influenced port planning and operations. The dredging or deepening of channels to maintain their navigability involves removing sediment , rock, and debris from the channel bottom. The bottom materials can vary from channel to channel, ranging from rock to sand to mud. Because dredging disturbs the channel bottom material as well as the plants and animals living in the water, its environmental impact depends partly on the type of channel bottom. Where channel bottom material is contaminated, disturbing the sediment can further degrade the environment by distributing or releasing these contaminants . (An example is in Long Island Sound, where the effects of early American silver manufacturing and other industries are noted.) Although preventing contamination in the first place is the overarching goal, the key environmental issue when considering waterborne commerce usually is the disturbance of contaminated sediments when waterbodies are dredged, and then finding proper disposal sites for these contaminated sediments. The most common measures used to gauge or track trade are weight and value of goods handled. The value of goods in dollars unit of measure represents the economic impacts of trade. Although the United States is serviced by several hundred deep-draft inland and coastal ports, about 76 percent of the value of goods can be attributed to eighteen ports (see box on page 254). According to the U.S. Army Corps of Engineers, the California ports of Los Angeles and Long Beach accounted for a combined 27 percent of value of trade (13.8 and 13.3 percent, respectively) in 2000, followed closely by the Port of New York City with 11.0 percent. The fourth-ranked port based on value of trade was the Port of Houston (Texas) with 5.9 percent. It is interesting to note the geographic distribution of the top four U.S. ports based on value of trade: two are on the Pacific coast, one on the Atlantic coast, and one in the Gulf of Mexico. Another important aspect is the direction of the value of trade. Trade is based on the two-way exchange of goods: import and export. Of the total U.S. international waterborne trade in 2000, the United States imported approximately 73 percent of value of the total trade and exported 27 percent. For the top eighteen U.S. ports (which accounted for 76 percent of value of trade in 2000) the balance of trade was also prevalent toward imports. With respect to the distribution of total value of trade between imports and exports, fourteen ports reported a ratio of imports to total trade greater than 60 percent; and four ports recorded a closer balance between imports and exports, with imports still favored between 50 and 60 percent. SEE ALSO Economic Development ; Navigation at Sea, History of ; Transportation . Bryan, Leslie A. Principles of Water Transportation. New York, NY: The Ronald Press Company, 1939. Hershman, Marc J. Urban Ports and Harbors Management. New York: Taylor & Francis, 1988. Kendall, Lane C. The Business of Shipping. Centreville, MD: Cornell Maritime Press, 1986. U.S. Department of Transportation. An Assessment of the U.S. Marine Transportation System: A Report To Congress. September, 1999. Marine Transportation System. U.S. Department of Transportation. <http://www.dot.gov/mts> . Navigation Data Center. U.S. Army Corps of Engineers, Waterborne Commerce Statistics Center. <http://www.iwr.usace.army.mil/ndc/wcsc.htm> . Ports: Your Connection to the World. American Association of Port Authorities Online. American Association of Port Authorities <http://www.aapa-ports.org/> . U.S. Port Totals by Type Service. U.S. Foreign Waterborne Transportation Statistics Program, U.S. Army Corps of Engineers, U.S. Department of Transportation. <http://www.marad.dot.gov/statistics/usfwts/index.html> . The following ports account for about three-fourths of U.S. trade, based on import-export total value for the year 2000. The ranking of the top ten ports remains fairly stable, but rankings thereafter may vary slightly from year to year.